MySQL is one of the most popular database server in website hosting business. Its popularity is not restricted to any specific industry. Whether you are dealing with social media or ecommerce you will find its relevance everywhere. Its functionalities include storage as well as organization of data and content. These data as well as content can be used for generating dynamic websites and at the same time web application’s backend. 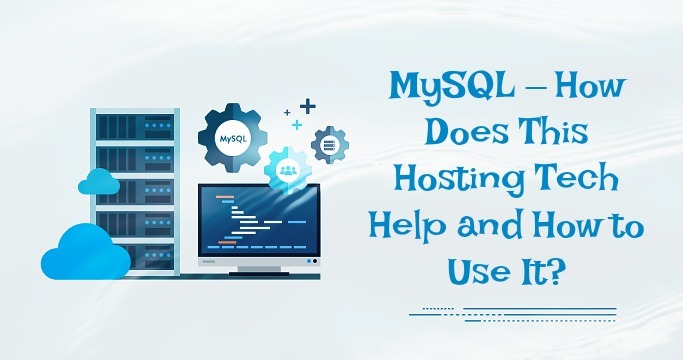 In this article, you will be able to know how MySQL is used, the associated benefits, the ways of installing, and the use of software on server. MySQL Database – Where and How is it Used? It acts as a massive storage engine that helps not only in online streaming and social media activities but also personal cloud storage, social gaming, fantasy sports, and many more. It is known by many persons that this specialized and highly popular database is used by some of the most renowned names in the industry and government sectors across the world. Some of the major sites that generate mindboggling amount of data and content are known to be using this database. Some of these names are Facebook, Candy Crush, Amazon, Zappos, Tumblr, Square, and many more. In fact, WhteHouse.Gove is also known to be using MySQL database server. MySQL Database – What are the Main Features and Benefits? One of the most powerful aspects of this server is that it comes with incredible versatility and that’s the main reason of its high popularity. Not only the big names in wide array of verticals but also many industries prefer using MySQL and they include entertainment, healthcare, gaming, social media, and else. There is a common aspect in all these industries. All of them produce lots of content as well as data on a regular basis. So, more the content or data production, it becomes that more suitable for choosing this database. How to Speed Up MySQL Data Imports? Firstly, reading of data will be discussed. Before discussing about XML parsing, it is more important to talk about the format that can be employed for data transfer. Some of the formats that can be potentially used are YAML, JSON, or even CSV (the quintessential old school format). XML can be read by machines as well as human beings. That’s why it has been used so extensively over the years. Vocabulary can be created by the users so that they can be used later for describing data. An example will make it easier to understand. Suppose, there is a number “42” that needs to be exchanged remains meaningless until and unless data’s meaning is exchanged too. One such instance is surely the temperature of CPU, which should be expressed in terms of degree Celsius, otherwise there is no meaning associated with “42”. In fact, constraint rules can be applied to XML instance document’s content. The constraint rule’s specification is allowed by XML schema documents as well as DTD (Data Type Definition). However, there is a downside too that is associated with XML format. It will be very difficult for parsing newer formats with XML. With metadata inclusion, it becomes extremely verbose. Right choice of language is very important. It is the third and fourth programming level languages that have made work of developers easier. Does it need advanced programming language such as C#, Python, PHP, or Java? No, it doesn’t need any of them. Assembly language is the strongest way of corresponding one-to-one. Either C / C++ can be used or PHP-JSON combine. Parsing can be done either on a one-element at a time basis or one node at a time. These are some of the basic information one should have in speeding up MySQL data imports. To get more information on the same, wait for the next article in this series.